Reviewed by Ray Van Horn, Jr.
You can either take the stance that Finland's Entwine is a pretty heavy Goth rock band, or you can say they're a very tame metal band. Whatever your position is, what can best be said about Entwine is that if you hang with them for a couple of listens, these dudes really grow on you. Knowing his cult is considerable, I never really saw the appeal of H.I.M. at first, and still I thought often of H.I.M. as Entwine's diEversity progressed along. The final summation, I believe, is that both are harmless and catchy, guilty pleasure music best enjoyed mostly in private, or amongst kindred souls. What's really notable about Entwine is that if you had no clue they were Finnish, you'd easily take them for American, both in look and in sound. They're that Americanized. Save for synthesizer sprinklings on top of "Bleeding For the Cure" that would indicate a European texture, this song sounds like a crossbreed between H.I.M. and (oddly enough) Three Doors Down. I'm singling this song out, because if there's a likely candidate that Entwine could launch themselves with, it's this song. Its pop rock infrastructure is almost sure to get the attention of its intended demographic. Upon the initial listen, I nearly yawned myself through the first half of "diEversity," thinking desperately upon how groovy I'd think it would be if Sisters of Mercy and Marilyn Manson would complete the ultimate Goth tryst, and I admit that's pretty unfair. So I gave this album a second chance immediately and no, these guys are not going to win you to their cause if you're looking for Kult ov Azazel. Nevertheless, there's a commercial sensibility to Entwine, apt pupil-ship studied from abroad on how to piece together a tight and accessible unit that American audiences will flock to. Jams like "Still Remains," "Someone to Blame" and "Frozen By the Sun" keep "diEversity" thrumming along steadily and most assuredly Entwine demonstrates a remarkable ability to create catchy and driving tunes. This superseded my initial impressions, so much that the familiar dramatic licks of "Refill My Soul" amped the aquatic verses in a slower similarity to Hoobastank's "Reason." Derivative? Absolutely, but damn if it doesn't work. As does "Nothing's Forever," which boasts an irresistible chorus. Okay, so maybe we could've done without the droning final note on the eight minute closer "Lost Within," which was a pretty powerful tune to wrap with, but that's nitpicking. 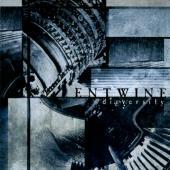 If you can shrug off the fact that Entwine is posturing as Goth metal, you'll do fine with "diEversity." Their music is played safe and by the textbook, but it's quite effective and better than face value if you give it more than one chance.